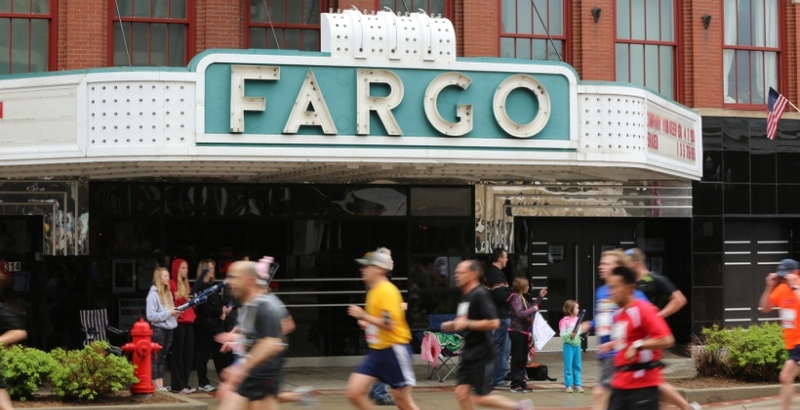 In less than a month, I’ll be running the Fargo Marathon. Now before you go trash-talking Fargo, let me tell you something. I drove through last September, and was immediately smitten by the small town feel. The tallest building downtown was… not tall. Several stories, maybe? I found shops and boutiques and restaurants, a brewery, a bike shop, and an Amtrak station. My experience was brief, but I found Fargo to be a sweet community, with affordable real estate, a growing economy, and a great arts scene. It just felt so live-able. I have a crush on it. Plus, dontcha know their marathon is flat as a pancake? And since this is my first 26.2, that sounded great to me. Being nearly 17 weeks into a 20-week training plan, I’ve reached the point where I’m just sort of over it. This Friday, I’m slated to run 20 miles — the longest distance so far — and lest you think I’m a confident runner these days, know that I will spend every moment between now and then in utter anxiety. These long runs are brutal, because while I know I have all of the physical and mental stamina necessary to finish the race, I didn’t anticipate that it would be so painful. It just hurts. Oh my →SWEAR WORDS← goodness. But no matter how my 20-mile run goes, and no matter how the full marathon goes, I will always be proud of myself for deciding to do this and then just doing it. I haven’t had a training partner or a running club; every single run has been by myself. Whether running 18 miles on a deadline (rushing before picking someone up at the airport) or 3 miles in the pouring rain the morning after a delicious yet irresponsible night of Scotch (whoops! ), I’ve just kept getting out there, with no one motivating me but me. I’m not a good runner. I don’t love it. I’m not fast. I’m not leggy and lithe (if you want to know how much weight I’ve lost, the answer is +7 lbs). But I was ready for a challenge, and chose my challenge, and have followed through on the challenge. What more can one ask of oneself? I’ve been largely absent online these days — quieter than usual on social media, and nearly non-existent on this blog. I’m under no delusion that people notice, because the Internet is a loud, loud place where anyone’s absence is immediately filled by a hundred other voices. But since hootenannie.com is my party and I’ll talk if I want to, I’ll say this: the past four quiet months have been so good and so necessary for me. They’ve been fertile soil, and good things are growing. The 362 miles I’ve run so far have been a big part of that, and I never want to forget it. Anyway, I’ll letcha go (just practicing my Fargoan). But just as a poll, do you know what hotdish is? I had never heard of hotdish before I moved to Minnesota — but you guys, it’s a casserole topped in TATER TOTS. What the heck. It’s either a nightmare or a dream-come-true. You decide. Oh it sounds like a definite “dream come true” in my book! C’mon, marathon, get here already! Go Annie! Go Fargo! 362 miles so far?! That is just crazy. And yes, as a Midwesterner born and raised, I know what hot dish is. But we didn’t call it that in my house. It was just tater tot casserole and it was magical. I always notice. Favorite blogger of life till death. I’ve added to my slogan for you. Great job following through Annie. As someone who doesn’t follow more than a few personal blogs consistently, you were missed! Of any number of ingredients. I love hamberger pasta spaghetti sauce and cheese!❤️???? 362 miles buys a lot of hotdishes… ;-) You go girl!